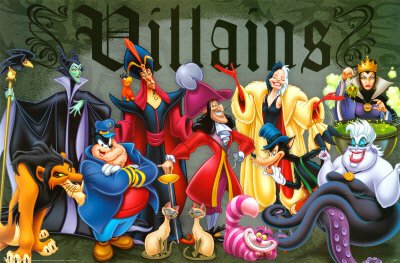 Growing up with Disney’s version of fairytales, I’ve always found that I sympathized with the villains more than with the helpless princesses. I’ve often recreated the stories in my head to fit my ideal of the villain (or villain-ness) being the “good guy”, or at least less evil. Cinderella was a schizophrenic who locked herself in the attic and talked to rodents. Her “evil” stepmother was just trying to give her things to do in an attempt to root her into reality. Maleficent, the “evil” fairy from “Sleeping Beauty” was upset they were leaving her out of things. They hurt her feelings and she did something rash, but it was something she knew the other fairies could prevent. Also, the Prince was probably a jerk, so I like to think that she was trying to protect the Princess. Even Ursula from “The Little Mermaid” wasn’t that bad. She fell for King Triton and he shunned her because she didn’t fit the stereotypical version of beauty (But damn that woman/octopus could put on lipstick.) so when his daughter came to her and asked for her help so she could be with the man she loved, of course Ursula helped, and why shouldn’t she get something out of it? With this anthology of re-imagined fairy tales, I was able to delve deeper into these thoughts and flesh out one of my own ideas about the truth behind the polish. This collection focused on the original fairy tales, not the Disney versions, so they were darker to begin with and the writers took them even further into darkness, deeper into the realm of the bizarre. “She is still alive?” Mikkel clenched his fists and wished, not for the first time, that he had something to throw, some way of venting his frustration. “Now Mikkel, my love, she should be dead, I am trying.” The Queen knelt before the mirror, her eyes wide and wet with tears. “I’m sorry Mikkel.” The queen sobbed. “Your Huntsman lied to you and let the girl go. You’ve tried suffocating her with bodice laces, poisoning her with a comb, yet still she lives.” He pushed his fingers roughly through his hair, wanting nothing more than to wrap them around the Queen’s pretty little throat. “It’s not my fault Mikkel, I swear.” She whimpered. His lip curled as he sneered; he shook his head and forced himself to relax. “I know.” He said softly. “But I am beginning to think that you do not want me to be freed.” He sighed heavily and closed his eyes, he silently counted to three before he forced out a tear. Interested? 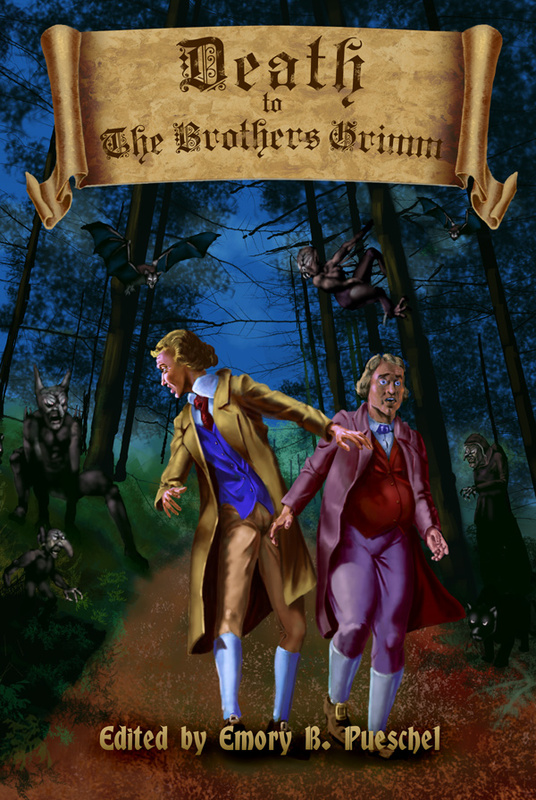 Death to the Brothers Grimm is available on Amazon in both paperback and ebook editions. One lucky commenter will win a paperback copy of the anthology! (It’s pretty!) So leave a comment and tell us about your favorite fairy tale. The Little Mermaid has always been a favourite Disney movie (us redheads have to stick together, ya know :P); though I learned early on that the tale is much Grimmer than the singing crustacean(s) would have you believe. OK, The Little Mermaid is actually Anderson, but where's the pun in that? I also love The Six Swans, especially Juliet Marillier's adaptation "Daughter of the Forest". My favorite fairy tale.... Has to be Cinderella. I like the dress!! I don't know where my daughter (Crysa Leflar) got her "Grimm" side from, but, man, does she write it well!! I love The Juniper Tree, it is so wonderfully wrong and creepy. The mother kills the boy and cooks him for the father to eat and gets revenge as a bird. like many girls ive loved fairytales, princesses,magic ect! these stories give a different taste of the fantasy life. wether it be darker or just plain bizzare! theres nothign wrong with a shiny golden castel and a happily ever after but whats the fun in that!? "the end?" life doesnt end in the middle of the story! i dont have a favorite fairytale they are all just to good to pick from but i love the ideas and plots that make these stories what they are! thats why i want this book to add to my collection of fantasy! if i cant be a princess then by god i will read about them!!! An amazing writer! I absolutely love when you talk about ursela! Can't wait to read more of your work! I always felt like they kind of asked for it from Malificent, as well. Self-fulfilling prophecy, you treat her badly and she'll be nasty to you! Besides, she had real style. My favorite has always been a German folktale about a woman called Frau Holle. It was like Wonderland 1.0-- you went down a well, and suddenly you were talking to trees and animals, and this little old lady could make it snow by shaking out her bedsheets. Crysa, what an interesting idea - to switch focus to the villain. I sympathize. I too often want to follow other characters than the heroes in a story and see where their roads, neglected by the writer, will take them. Some of those eventually became my short stories (published) and one even developed into a novel (as yet unpublished). Hans my Hedgehog, definitely. For anyone who's felt like an outcast and generally unusual its such a beautiful story. A husband and wife can't have children and the wife makes a wish that no matter what her baby looks like, she'll love him anyway. She does give birth - to a hedgehog, who everyone makes fun of until he runs away. Its OK it has a happy ending. There's more to the story and you should watch a series I've always loved called The Storyteller if you haven't already, it's amazing. As to the Disney princesses, God how did they survive as far as they did? Thanks a great movie that i ever play. i highly appreciate your work.